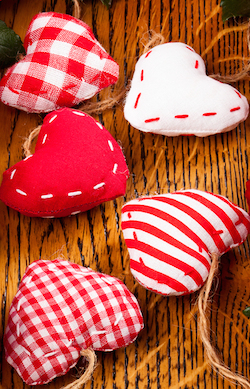 Many people like to sew Christmas ornaments for their own decorating purposes or to give as gifts. 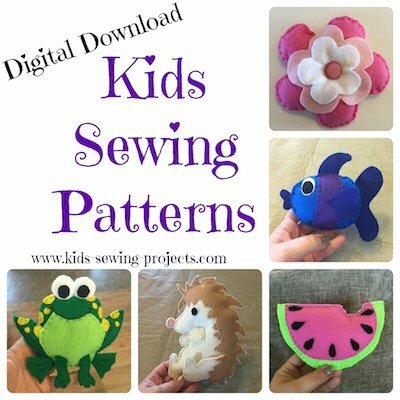 The beauty of homemade ornaments is that a sewing machine is not always necessary so the entire family including kids of various ages can participate in the activity. Some are easy to do and are quite popular, while others take a little more time and effort, but the result will be worth it. You do not need a lot of money for these ornaments; in fact, sometimes using things you already have at home make wonderful pieces. Using your cookie cutters to trace, with pencil or chalk, on your scraps of material. Fold your material so it is doubled because you will need two sides for each ornament. Zigzag stitch around traced shape leaving a hole for stuffing. Stuff with batting. Sew shut. Trim around material leaving 1/4-1/2 inch material around edges. 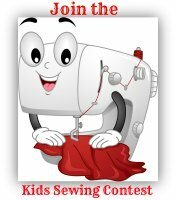 Cut a length of ribbon or string and sew to top or hot glue in place. To make a snowman ornament, use white felt and follow the directions above. Then glue on google eyes, buttons and other decorations. For a gingerbread man, use brown felt and add decorations to finish your ornament. For a Christmas tree ornament use green material and glue small pom poms on for decorations. You can change the holidays by changing the shapes! This can be sewed or not depending on preference. First, use a cookie cutter to outline the shape of a star onto construction paper and the fabric. Use scissors to cut the shape out of both materials; you will need two pieces of the star-shaped fabric to cover both sides of the construction paper. For a neat edge, you may want to sew around the edges of the fabric before pasting it onto the construction paper. Cutting out stars from old Christmas cards and using them as the base instead of construction paper is another option. To match sizes, use the stars to make outlines on the fabric. The paper or old cards give the star a stiffer and sturdier look. 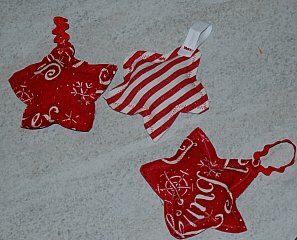 Once you sew the two fabric stars together with the paper sandwiched inside you can decorate with beads, trim, etc. For those who may be too young to sew Christmas ornaments, get some small pom- poms and glue festive colored fabric onto them, cover with glitter or tiny stars for an easy to make, yet pretty ball ornament. Ball ornaments are easy to make by covering a Styrofoam ball with fabric, and gluing beads and anything else you may want to use to decorate it. Cut the fabric to the right size and hand sew into a bag, drop in the ball and tie off the top with a string. This string can then be given a loop for hanging on tree branches. To make it more attractive, you can glue beads, feathers, glitter and other items onto the fabric. 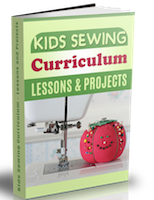 Another option is to add ribbons or strips of fabric onto a Styrofoam ball. Start at one end of the circle and attach strips by pushing straight pins with flat heads at the end of the ribbon. Continue all around until circle is covered. Add any embellishments you'd like to finish them off. Many people find that they can sew Christmas ornaments at minimal cost and best of all, many items can be done in a few hours or less. Whether you want to give them away, sell or keep them for your own use, these pieces can help create the festive spirit the holiday deserves.